Treat yourself to a taste of the tropics with our Tropical Crunch Blend! 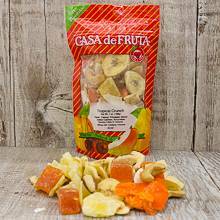 Pineapple tidbits, papaya chunks, banana chips, roasted cashews, mango slices, coconut chips, and brazil nuts blended together for a sweet and crunchy mix. Packaged in a 7 oz. bag.